Life takes a big turn on Monday for Japanese young people. Coming of Age Day, Seijin no Hi, recognizes all who turn 20 years of age this year. Twenty is considered the official point of attaining adulthood, and with it, the rights to vote, drink and smoke. Ceremonies and celebrations are held nationwide, with the most visible signs of the day being sharply dressed young men and the ladies in their colorful kimonos. Seijin no Hi is a national holiday, with municipal governments across the country hosting special coming-of-age ceremonies to recognize their new rights and responsibilities. Here in Okinawa, skirmishes and scuffles between authorities and young people have led many communities to spread out the ceremonies, or curb them. In some cases, the ceremonies have been canceled and celebrations left to families. Coming of Age Day has been celebrated the second Monday in January since 2000. Before that, it was January 15th, as the day to mark the transition to adulthood. Centuries ago, boys were viewed as coming of age at 15, while girls celebrated coming of age at a mere 13. During the Edo period, covering 1603 – 1868, the ceremonial pageantry included boys cropping their forelocks, and girls dying their teeth black. In 1876, the government decreed 20 to be the legal age of adulthood. Monday will be festive, and the girls will be the more elaborately dressed. While the boys mostly wear suits to coming-of-age ceremonies, the girls turn to traditional kimonos. Here in Okinawa, the styles are even more varied, with puffy sleeves, elaborate designs and brilliant colors. 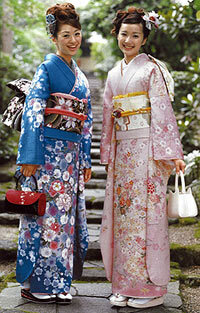 Furisode, the most formal of kimonos worn by unmarried women, signifies the transition of young ladies into the adult realm. Costs may vary, but the more elegant kimonos can range upwards of ¥1 million, with accessories and beauty shop adding another ¥50,000-100,000. Traditional portraits can boost the figure yet another ¥50,000, making Coming of Age Day truly a day to remember.